ItemI-52530 - "Mount Arrowsmith from Alberni, 5976 feet in altitude, is a dominating feature of the area draining to Cameron Lake". ItemI-52516 - "Waddington Canyon on the Homathko River". ItemI-52517 - "Schnarr the guide, points out the location on the Tiedemann Glacier where the Waddington Trail was planned to cross". ItemI-52651 - "Moose on the Ground-hog Range, Cassiar district; moose at bay with one of the dogs of the survey party seen in the distance". ItemI-52652 - "Moose on the Ground-hog Range -Cassiar district; Darby and Joan uncertain whether to run or to stay and investigate the new arrivals". ItemI-52656 - "Mr. Barrett's ranch near Houston-Bulkley Valley, the oat crop is cut for hay". ItemI-52657 - "Tatalaska Lake about 6 miles southeast from Macdonald's Landing on Francois Lake". 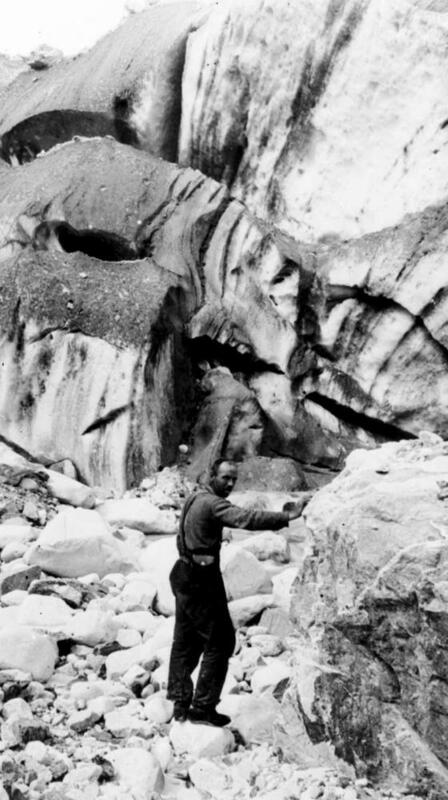 Item I-52517 - "Schnarr the guide, points out the location on the Tiedemann Glacier where the Waddington Trail was planned to cross".